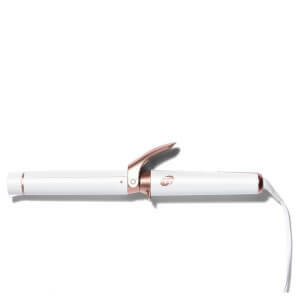 Create tight, sleek curls with the T3 Polished Curls Clip Barrel attachment, compatible with the T3 Twirl and Whirl curling irons. 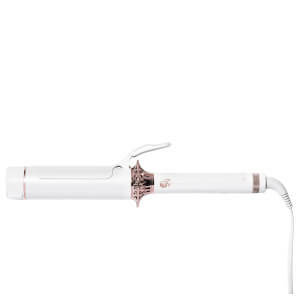 Featuring a Tourmaline and Ceramic coated 1.25” barrel with a clip to prevent frizz and maximize shine, the innovative interchangeable styling tool allows for endless looks with minimal heat damage. 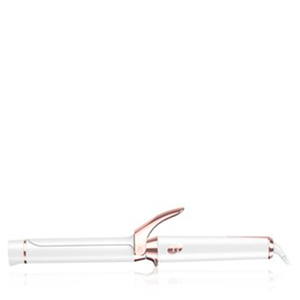 Simply click in your chosen barrel and get curling for gorgeous salon-perfect results. Camera Lens-inspired Locking Mechanism: Makes changing barrels fast, easy and secure. This barrel cannot be used without the purchase of an accompanying tool. Compatible with Whirl Trio, Whirl Convertible and Twirl Convertible. Begin with dry, detangled hair. Divide hair at the temples and secure the top half out of the way. Then divide the bottom half into 1-2” sections to begin styling. Secure the ends of a section underneath the clamp and roll upwards, wrapping the hair evenly around the barrel. Hold for a few seconds, then release the clamp. For loose, wavy curls, tug slightly on the section before allowing it to cool. SWITCHING THE BARREL: Line up the side pins on the barrel with the slots in the handle of your Whirl Trio, Whirl Convertible or Twirl Convertible base and insert the barrel firmly into the handle. Rotate the lock until it clicks. The dot symbol on the barrel lock should line up with lock symbol on the handle when securely fastened.